Spread along the edge of a ridge, Nguni River Lodge is an idyllic base for exploring the majestic landscape, spectacular wildlife and fascinating history of Addo Elephant National Park. Guests at Nguni River Lodge are welcomed by a spectacular view over a pristine floodplain with the majestic Zuurberg Mountains as backdrop. The main facility consists of a comfortable guest lounge, a spacious dining facility and spectacular viewing deck. The luxurious Nguni River Lodge is an eclectic combination of architectural shapes, textures and colours combined with modern individually styled interiors. 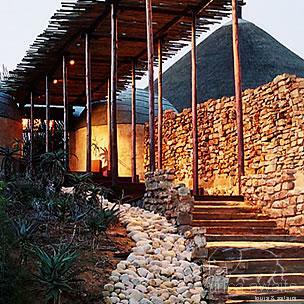 Natural building materials such as local rock and stone, sneeze wood logs, rough plastered walls with burned sienna floors and tawny thatched roofs make Nguni River Lodge retain an African simplicity. Nguni River Lodge speaks of the traditions, art and culture of Africa with soft comforting and luxurious furnishings, combining modern fabrics and finishes with traditional earthy tones and tapestries. The central fireplace in the main lounge area creates a warm and inviting ambience allowing our guests to arrive as strangers but leave as friends. The high level of service and South African haute cuisine, served from an interactive open plan kitchen or under the star-filled skies, will make your stay at Nguni River Lodge a memorable experience. 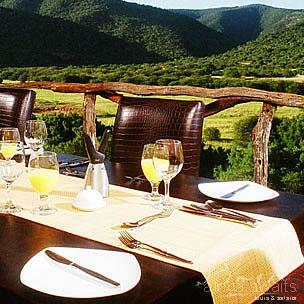 Relax, Recharge and Reflect in the incredible tranquillity and privacy of Nguni River Lodge. Guest are accommodated in 7 Luxury Standard Double Suites with en-suite bathrooms and 1 Deluxe King Suite, consisting of 2 bedrooms with en-suite bathrooms and a large central lounge area. All suites feature individually styled interiors, named after the colour pattern of the Nguni cow hide that inspired its décor. Each air-conditioned guest suite boasts a romantic bathroom with an opulent stone bath and outdoor shower, private plunge pool and fireplace, with spectacular views over the flood plain and water hole below. From the privacy and comfort of you private balcony, sightings of Addo’s abundant wildlife can be seen on the floodplain below. Awake to the sights and sounds of Addo Elephant National Park, refreshed and ready for an adventure filled day. With the emphasis on informal relaxation, Nguni River Lodge creates a fuss-free mood with a local character and high standard of personal service. Addo Elephant National Park incorporates 5 of South Africa’s 7 vegetation Bioclimatic Communities or Biomes. This extraordinary biodiversity within the ecologically diverse Addo region provides habitat for an amazing diversity of wildlife. Game drives at Nguni River Lodge are conducted in the mornings and late afternoons in open game viewing vehicles with informative field guides to ensure close encounters with the Big 5 and hundreds of smaller mammal, bird, reptile, amphibian and vegetation species. Addo Elephant National Park’s abundant wildlife is without a doubt the main attraction at Nguni River Lodge, where every sound, scent, footprint or broken blade of grass is a sign waiting to be explored. Situated in the scenic Sundays River region of the Eastern Cape, Addo Elephant National Park is the first wildlife sanctuary in the world to host the Big Seven. IT’s all about the view. The intoxicating sight of lush, unspoilt, African bushveld unique to the Eastern Cape. You can’t get away from it. It intrudes into every room and envelops you, demanding attention. Nguni River Lodge was identified by HIDEAWAYS international travel magazine as one of its 100 most beautiful hotels and resorts of the world. 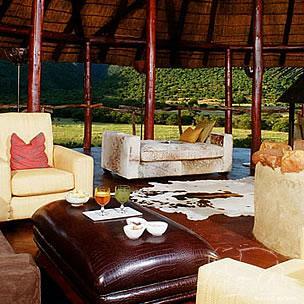 With your holiday, safari or business trip from in to Nguni River Lodge in Eastern Cape.